Pineapple Flavor E-Juice is very popular, especially in the western hemisphere. This tropical flavor is also a summertime flavor found in candy and fruity juices. 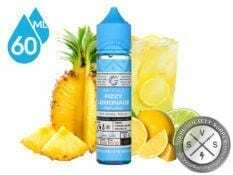 Pineapple is considered to be a dominant flavor in many e liquids because of the flavor extracts but if you’re a fan, we carry a wide selection to choose from. Nothing tantalizes the taste buds like freshly cut pineapple that’s straight from the islands. If this succulent fruit entices you like no other fruity flavor, it’s time to grab some pineapple-infused e liquids. Each of our pineapple flavors delivers that sweet and tangy taste that makes you dream of paradise as soon as you take a puff. Our collection consists of everything from pure, straightforward pineapple juices to truly innovative flavor creations and desserts that combine this juicy fruit with other tastes that make the mouth water. We only feature manufactures that are known for their high-quality. Our collection of pineapple flavors has delicious treats from award-winning brands like Naked 100, NKD 100 Salt, Nasty Juice, Glas Vapor Basix Series, Liquid State, and more! Nowhere else can you find such a diverse and extensive selection.